In European Club 2007, there are 56 teams participating in 23rd European Club Cup for Men and 18 teams participating in 12th European Club Cup for Women. The reigning champions for the last two years in men, Tomsk-400 and last years' winner for women Mika Yerevan are in Kemer to defend their titles. European Club Cup Opening Ceremony took place in Limra Hotel on 2 October 2007 at 9 p.m.
During the ceremony FIDE Vice President and CEO of Global Chess BV Geoffrey Borg, TCF President Ali Nihat Yaz?c?, ECU Board Member Werner Stubenvoll and Deputy Governor of Antalya Fazl? Akgün delivered protocol speeches. 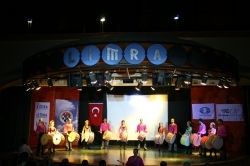 It is with great pleasure that the Turkish Chess Federation welcomes you here, to the Limra Hotel in Kemer, Turkey for the 23rd European Club Cup for Men and 12th European Club Cup for Women. Undoubtedly, this is the strongest event ever held to date, and we note with satisfaction that the top eight registered players work out at an average rating of 2747, just 4 points short of the World Championship just finished in Mexico. We also have a record number of teams and we hope that this will keep on growing in the future, following the hospitality and friendship we wish to extend during the tournament. Since my Presidency in 2001, the Turkish Chess Federation has organised successfully 3 European Individual Championships for men & women, 2 European Club Cups, 2 World U-16 Olympiads, a the World Junior Championship, the European Women Teams Championship, and the European Youth Championship and next month we will organise the largest World Youth Championship ever to date. We have designed a roadmap to excellence in chess. The main challenge for a chess Federation is to emphasize the issues that can leads to the public and the private sector working together on one platform and to discuss ways and means to bridge the gap that exists between the Government and the private sector. The government's role in any sports development is that of a facilitator. It is up to the Federation to promote chess in its country and attract corporate support. Normally, sponsorship is mainly restricted to some sports where visibility is greater such as football, basketball or athletics. By working with all our partners, we have been able to develop the relationship we enjoy today with Türkiye ?? Bankas?. This kind of a partnership has not only benefited the TCF, but brought our major sponsors greater, targeted exposure, and also good results to the country. Once this relationship is achieved, then chess will prove to be a good business opportunity. Chess will prove to be no less an important brand ambassador for any company or product. Also I have to mention that the key factor behind this success story is chess in schools. Today in Turkey, we have more than 200.000 members of federation, 1,5 million children who chose chess in primary schools. We are the number two sports federation after football and very soon we want to be number one. We hope that you will take the opportunity of enjoying your stay here and our experienced team of people will offer their full co-operation and assistance throughout the tournament. Good luck in your games and may the best team win ! I would like to give you the warmest welcome to the European Club Cup being held here in Kemer, Turkey. The "warmth" comes not only from the great weather we expect to have here, but also from the hospitality which our hosts consistently offer in all their events. I am sure you will also find the organisation of the tournament, by the Turkish Chess Federation, of the highest level possible. The presence of so many highly rated teams from all over Europe, as well as many of the world's best players promises that we will have a great event. The chess world has just come from a very interesting and well-contested World Chess Championship in Mexico these last three weeks, and I am sure that everyone will join me in congratulating GM Vishy Anand on his prestigious win. Chess has benefited greatly from this event and we saw a large number of interesting video reports and interviews on the tournament. We hope to provide the World with the same amount of media coverage these next two weeks here in Kemer. With enhanced and more professional media coverage, the chess world stands to gain, as our noble game gets wider exposure throughout the internet and hopefully on TV in the future. I therefore ask the players to fully co-operate with the organisers in any requests for interviews or press conferences as the case may be. This is part of our common mission to popularise chess. Whilst on one side we have a number of organisers, all over the world, willing to host world class tournaments, we still have to work hard however, to get global sponsors to invest and support our game. We can only achieve success by working together, increasing our expectations of hosting quality events, displaying a fighting spirit on the board and having a professional but social spirit off the board. With 56 men teams and 18 women teams from around 32 countries, this will be another great event. Thanks must go to the European Chess Union, to the Turkish Chess Federation, to all participating Clubs and players who have worked with such commitment, passion, professionalism and enthusiasm towards the success of this event. To all of them go our most sincere thanks. I welcome all participants of the 2007 European Club Cup. 56 men teams and 18 women teams have sent their entry. This shows that the European Club Cup is one of the most important tournaments ?n Europe and for sure the highest level team tournament. In this year, once more this event is organized by the Turkish Chess Federation and, as a lot of highly experienced organizers are working in the organization, I am sure it ?s well prepared. Therefore in advance many thanks to the President of Turkish Chess Federation, Mr. Ali Nihat Yaz?c? and to his team. I hope, all the participating teams will enjoy the accomodation and will have an interesting event w?th high level fights on the chessboards. First of all we are glad to host this organization in Antalya and we are very pleased to see you here. This event which is going to take place between 2-9 October which will host prominent chess players and we will have a chance to watch their exciting struggles. I hope our guests will return home with good impressions. I also invite everyone here to have their separate holidays, see natural, historical and culturally richness of our country. Finally, I would like to add that we all know the benefits of this distinguished sport, chess. There is a growing interest in chess in our country. Chess has some positive influence as an education tool, contributing to the development of the character of people and we also know that playing chess also prevents people from getting involved with bad habits. For these reasons, it is a mission for us to encourage children to play chess at the earliest ages possible. In this respect, I welcome our guests, and I wish good luck to all players.